As a kickstarter organization for yoga service projects of all types and sizes, The Give Back Yoga Foundation offers supply grants and funding to help certified teachers of all traditions to share yoga with underserved populations. 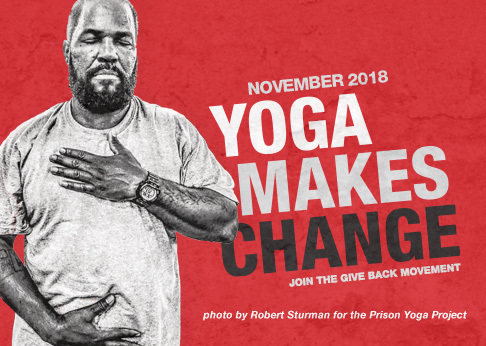 Through the generous support of our partners, Gaiam and lululemon, we are able to kickstart yoga service projects for populations who face social, physical, and economic barriers. To request mats to launch or expand a yoga outreach project, please fill out our online application. We appreciate the work of your organization. We are restructuring our grant program and will not be awarding grants for the remainder of the year. Please check back later, and sign up for our newsletter so we can send you an announcement at the appropriate time. The Give Back Yoga Foundation is interested in awarding yoga grants that will directly benefit underserved groups who might not otherwise have the opportunity to experience this transformational practice. Learn more about our eligibility guidelines and application process. Your support makes it possible for us to reach more people and make an impact through the healing powers of yoga. Thank you for taking action to make a difference. Together, we are creating a ripple effect of change that is touching the lives of individuals, and strengthening families and communities.